all poles with a press fit. Cleans any flat, smooth surface. —With handle, channel and rubber blade. —Stainless steel channel with soft rubber blade. adjustable screws to hold channel. —Includes rubber blade and clip. 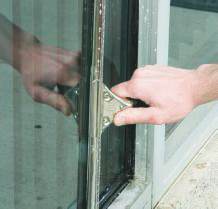 All-purpose window squeegee features durable reinforced rubber blade.